At the end of the year, an abnormal eel that could swim exceeding well and also run, climb, and fly a little had the highest average and was valedictorian. Note: This story was written when George Reavis was the Assistant Superintendent of the Cincinnati Public Schools back in the 1940s! This content is in the public domain and free to copy, duplicate, and distribute. If you would prefer a full-color, illustrated book, one is currently available from Crystal Springs Books (1-800-321-0401 or 603-924-9621) or from Amazon. 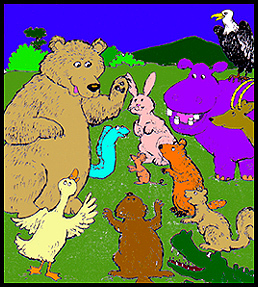 Click here for a song based on The Animal School by Mark Meritt and the Offhand Band. Interesting concept, but how does this fit “compulsary learning” model we are going through in ILD classes in Texas? I like the idea of teaching kids in all areas and focus on their individual skills but since we have high-stakes testing, kids and teachers are also rated on commended as well as passing scores. I’d like to know more about assessment based on Gardner’s Intel but that seems to be in the distant future and some view it as too selective and like the Chinese model of predetermining what a child should become someday. Is there an answer for everything? David, hi. Excellent questions. I don’t know the current Texas mandates, though I understand that they have not adopted the Common Core State Standards (which I’m still pretty wary of but which, I’m told, in the right hands could answer some of these questions. I’m still exploring this new venture.) I also like offering kids opportunities to grow in a variety of areas and yes, pushing them beyond their comfort zone. I think the whole point of this piece was to question the “assembly line” approach to education that tries to shape every child into the same mold. (That this was originally written some 70+ years ago and is still so relevant today is probably the piece that fascinates me the most.) I’m also concerned about building educational goals around high stakes test results, as this is such an incredibly limited way of assessing kids, teachers, and learning. And I’m not much of a fan of predetermining a child’s future based on anything, as interests and skills develop over the course of a lifetime. I do know teachers who were willing to start with the child, teaching and coaching, pushing and encouraging growth from the skills and interests that child brings to the table, and opening doors for exploration and expression in new and different areas. This takes a fairly remarkable amount of skill, maybe a bit of “teacher intuition,” and the willingness to look beyond “getting through what’s on page 52.” And I doubt that this kind of teaching can happen in an environment that prescribes and predetermines the lesson-for-the-day, regardless of who is in the classroom and what those individual children need or how they learn. We have a good way to go to move beyond where we are right now and I can only hope that schools one day become a place where these learning goals can be met. I like the way the animals were challenged in different directions and were successful in mastering them and not doing the things we already know, over and over again. What is still bothering me like that little duck is that we should not reach a point where we lose our existing skills on mastering new ones. I certainly agree with challenging students to go beyond their current mastery and try new things. And I think the example of the duck illustrates (in a sad way) a possible outcome of having the same exact expectations for every student. Thank you for writing. Yes, “The Fable” has a moral, which is that a one-size fits all mentality for educating, does not produce authentic outcomes that last. Fair is not always equal (as in the same) or best. I completely agree. (Preachin’ to the choir, as they say.) Even veteran teachers in some settings are being written up for attempts to accommodate different students. Follow the money and I think you’ll find why we’re still set up to teach for a 1950 economy. Very sad.